Vegetable lasagna recipes often require you to make a bechamel (white) sauce. Not this one. It is easy because you just sauté the vegetables, then stir in jarred or spaghetti sauce. Heat olive oil in a large (12- or 14-inch) skillet over medium heat. Add onions, garlic, and peppers. Sauté several minutes until vegetables start to soften. Add zucchini and mushrooms. Sauté 2 to 3 more minutes until the vegetables have released most of their water. Stir in spaghetti sauce. Bring to a boil, then reduce heat and let the sauce simmer about 7 to 10 minutes. Taste and adjust seasonings. In a medium bowl, mix ricotta cheese, eggs, and asiago cheese together. Set aside. Spoon about 3/4 cup of the vegetable sauce into the bottom of a 9 x 13 pan. Top with four lasagna noodles, going crosswise. It's okay if they overlap. Top with 1/2 of the ricotta mixture, the Parmesan cheese and 1/3 of the sauce. Top with four more lasagna noodles, the remaining ricotta mixture, 1 cup of the shredded mozzarella cheese and 1/3 of the sauce. Top with the remaining lasagna noodles and remaining spaghetti sauce. Sprinkle the remaining mozzarella over the spaghetti sauce. Cover with aluminum foil, and bake 30 minutes. Remove foil, and bake another 10 to 20 minutes until golden and bubbly. 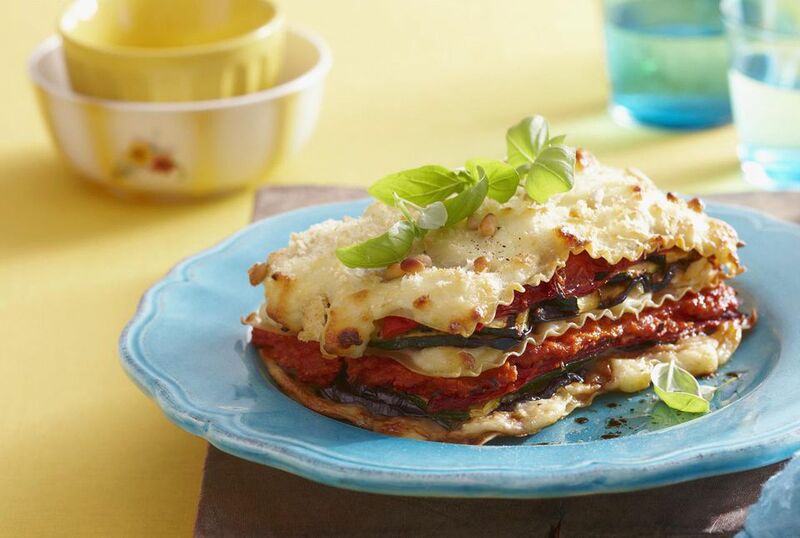 Let vegetable lasagna rest 15 minutes before cutting. Serve this vegetable lasagna with caesar salad and garlic bread.